This Saturday at Heinz Field, the Pitt Panthers and Penn State Nittany Lions will renew one of college football’s most storied rivalries after a 16-year hiatus. The in-state battle for supremacy between Pennsylvania’s only Power Five conference schools –– now known as the Keystone Classic –– has created plenty of drama between fans, players and even coaches over the course of 96 meetings since 1893. Penn State won the first game by a 32-0 shutout in 1893 and leads the all-time series 50-42-4, but Pitt battled back and won the last meetup in 2000. The last time these two teams met, Penn State had taken complete control of the rivalry. The Nittany Lions won seven matchups in a row from 1989 to 1992 and then again from 1997 to 1999 after a four-year hiatus. In 2000, the teams squared off at Three Rivers Stadium in Pittsburgh for the final time, and Pitt’s defense closed one chapter of the rivalry the same way Penn State started it –– with a shutout. The game was also the beginning of quarterback Rod Rutherford’s illustrious career with Pitt. A pair of field goals by Nick Lotz sandwiched around Rutherford’s weaving 62-yard touchdown reception from John Turman gave the Panthers a 12-0 victory in what seemed to be the final matchup in the series at the time. Rutherford went on to become one of the most decorated quarterbacks in program history, tying Dan Marino’s single-season school record of 37 touchdown passes during the 2003-04 season. This electric performance is where he first made a name for himself. Penn State owned the rivalry in the ‘90s, winning all six games that decade. But in the ‘70s and ‘80s, both the Panthers and the Nittany Lions always seemed to be in the national title chase by the time the teams met in late November. These showdowns featured rosters that were littered with NFL talent, and the whole country tuned in to see who was going to emerge as the best team in Pennsylvania with a chance to play in a national championship. In 1978, Penn State was the team with title hopes on the line. According to The Morning Call, Pitt head coach Jackie Sherrill called Nittany Lions head coach Joe Paterno “unethical” after asking officials to inspect Pitt players’ cleats before the game. The Panthers came out fired up and looked ready to derail Penn State’s season. Late in the fourth quarter, No. 15 Pitt led 10-7 against No. 1 Penn State. Rather than attempt a game-tying field goal, the Nittany Lions went for it on fourth-and-2 from the Panthers’ 4-yard line and converted with a go-ahead touchdown run by Mike Guman. An interception sealed the 17-10 win and a chance at a national championship for Penn State, but Alabama defeated the Nittany Lions in the Sugar Bowl, 14-7. He may not have mentioned the Panthers by name, but everyone knew Paterno was purposefully calling out Pitt’s schedule — one he didn’t think was particularly rigorous. Pitt entered the game undefeated and as the top-ranked team in the nation, but Penn State’s coach wasn’t buying the Panthers’ strength. Early on in the November game, it looked like Paterno was going to regret those words as Pitt jumped out to a 14-0 lead in the first ten minutes on a pair of touchdown passes by Dan Marino. Then, when defensive back Roger Jackson intercepted a would-be third touchdown pass in the end zone for the Nittany Lions, a seismic shift in momentum occurred. Penn State scored the next 48 points to win, 48-14, ending the Panthers’ perfect season and knocking them out of the national championship game. The 1982 matchup was a clash between two of the top five teams in the nation: the No. 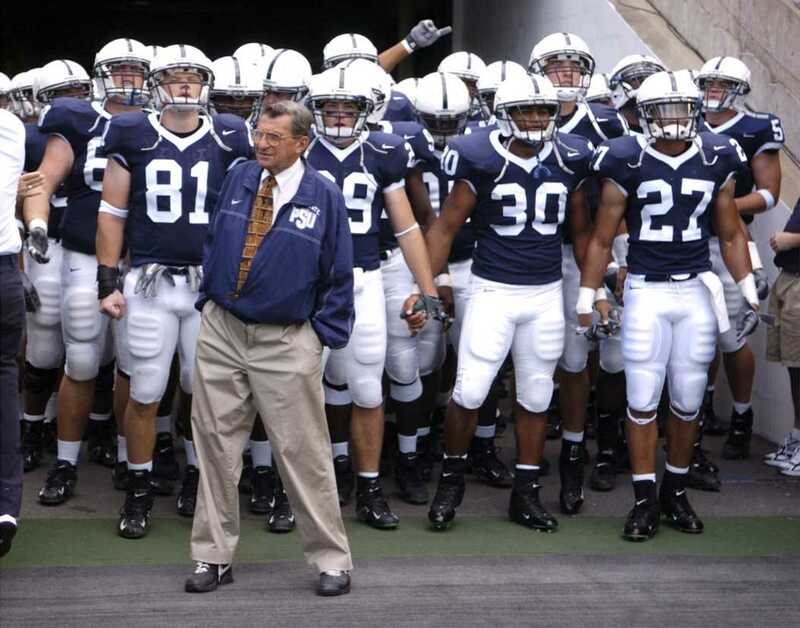 2 Nittany Lions and the No. 5 Panthers. Both teams entered with nine wins against just one loss, and the winner would remain in the chase for the national championship going into its bowl game. Pitt forced three turnovers in the first half, but the Nittany Lions managed to keep the game close as the Panthers led 7-3 at halftime. For the second year in a row, Penn State quarterback Todd Blackledge outplayed Marino in a come-from-behind victory, and the Nittany Lions dashed Pitt’s national title hopes –– this time with the help of four field goals by Nick Gancitano. Penn State would go on to defeat No. 1 Georgia in the Sugar Bowl, 27-23, to earn its first national championship. The Nittany Lions entered the season finale showdown with the Panthers in 1976 having won ten consecutive meetings in the series dating back to 1966, the first year Paterno took over as head coach. They won the first nine of those matchups by at least 20 points. Pitt had nearly ended the streak a year earlier, but Panthers kicker Carson Long missed three field goals and had an extra point blocked in a crushing 7-6 defeat. In 1976, the Panthers emerged as the best team in the nation but still faced one obstacle standing between them and a chance to play for a national championship –– Paterno and those Nittany Lions. With the game tied 7-7 at halftime, Pitt head coach Johnny Majors decided to shift Heisman Trophy winner Tony Dorsett from halfback to fullback. The move paid off, as the future Hall of Famer ripped off 173 rushing yards in the second half, finishing with 224 yards and two scores. Dorsett led the No. 1 Panthers to a 24-7 win to cap off a perfect regular season and became the first player in NCAA history to rush for over 6,000 career yards. Pitt went on to defeat Georgia in the Sugar Bowl 27-3, clinching its first national championship in 39 years.